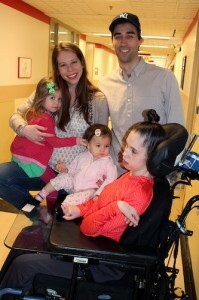 Matheny resident Jaime Barnes with, clockwise from left, Madeleine, Elenore, Chelsea and Matthew Mitschele. This year, both Chelsea and Matthew are planning to run in the 5K before moving over to cheer on the participants in the Lu Huggins Wheelchair Walk. Their three-year-old daughter Eleanore will be competing in the Kids Fun Run. As of May 9, Team Jaime had raised $525, but the Mitscheles were hoping that number would rise after they reached out to more family and friends. Peapack-Gladstone Bank; Porzio, Bromberg & Newman PC Attorneys at Law; BP Fueling Communities; Delta Dental of New Jersey Inc., WCBS-TV and WCBS Newsradio 880. For more information about Miles for Matheny, log onto www.milesformatheny.org or call (908) 234-0011, ext. 260. To help support Team Jaime, log onto the team web page. This entry was posted in Uncategorized and tagged Chelsea Mitschele, Jaime Barnes, Miles for Matheny. Bookmark the permalink.